Cosponsored by the Lillian Goldman Law Library and the Yale Environmental Law Association. Please join Richard Revesz, YLS ’83, Lawrence King Professor of Law and former Dean of NYU School (2002 – 2013), for a Book Talk, with Commentary by Douglas Kysar, Joseph M. Field ’55 Professor of Law at Yale Law School, on Tuesday, February 2, 2016, at 6:10 – 7:00 pm, Sterling Law Building 124. Since the beginning of the Obama Administration, conservative politicians have railed against the President’s “War on Coal.” As evidence of this supposed siege, they point to a series of rules issued by the Environmental Protection Agency that aim to slash air pollution from the nation’s power sector . Because coal produces far more pollution than any other major energy source, these rules are expected to further reduce its already shrinking share of the electricity market in favor of cleaner options like natural gas and solar power. But the EPA’s policies are hardly the “unprecedented regulatory assault ” that opponents make them out to be. Instead, they are merely the latest chapter in a multi-decade struggle to overcome a tragic flaw in our nation’s most important environmental law. In 1970, Congress passed the Clean Air Act, which had the remarkably ambitious goal of eliminating essentially all air pollution that posed a threat to public health or welfare. But there was a problem: for some of the most common pollutants, Congress empowered the EPA to set emission limits only for newly constructed industrial facilities, most notably power plants. Existing plants, by contrast, would be largely exempt from direct federal regulation-a regulatory practice known as “grandfathering.” What lawmakers didn’t anticipate was that imposing costly requirements on new plants while giving existing ones a pass would simply encourage those old plants to stay in business much longer than originally planned. Since 1970, the core problems of U.S. environmental policy have flowed inexorably from the smokestacks of these coal-fired clunkers, which continue to pollute at far higher rates than their younger peers. 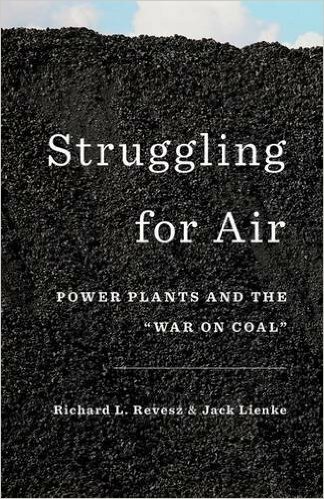 In Struggling for Air, Richard L. Revesz and Jack Lienke chronicle the political compromises that gave rise to grandfathering, its deadly consequences, and the repeated attempts-by presidential administrations of both parties-to make things right.